Learning to cope with Fibromyalgia is stressful. Your body becomes unpredictable and you rarely know what to expect from one day to the next. This creates stress and can often make us feel even worse. Coping with stress can be a key to improving your Fibromyalgia symptoms. Often the only way to learn to cope is by successfully or unsuccessfully handling specific situations. 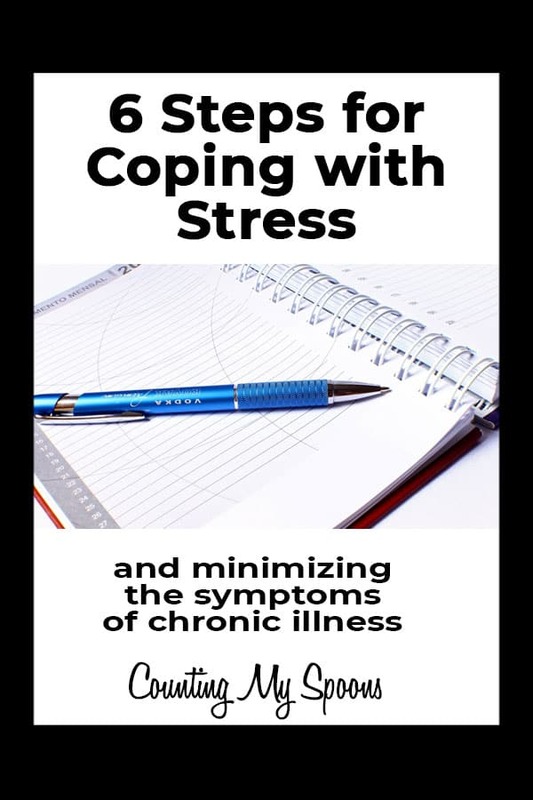 There are six key steps that you can take to help you as you learn to cope with fibromyalgia, other chronic illnesses, or any stressful situation. Coping with stress first requires that you identify the specific triggers that create stress, or increase your pain and fatigue. Often we don’t directly see how things are stressing us, but our body lets us know through the pain and fatigue. The best way identify stressors and triggers is to keep a daily journal that monitors your symptoms and stress level, as well as what you did that day. Track what you eat and do every day, who you spent time with, and even the weather. Do this for at least 30 days to get a full view of your life and you will find the activities, people, and foods that make you feel worse. Once you know what things in your life cause you stress, you can begin to take steps to reduce your interaction with those items. Really meditate and think about what you can change. Set specific goals that you want to meet. It’s often helpful to break them down into smaller goals when possible. Change is difficult and some changes are easier to make than others. In some situations, you may be able to completely remove a stressor from your life (in the case of foods or activities). In other situations, you may be able to find different ways to respond to a stressor. Write down what you intend to change in your journal. If it’s not written down it’s not a goal. Once you’ve set goals regarding what you want to change, you can begin to make a plan to help you make those changes. Will you be changing your diet? Will you need to stop spending time (or as much time) with certain people? Are there certain activities that you need to limit? Write your plan and prioritize which items you want to change first, whether it’s starting with an easy item, or just the item you feel is most important. Now that you have a plan, it’s time to take action. You may want to try to change everything at once, but if the thought of that gives you more stress, don’t do it. It’s often easier to work in baby steps, changing one thing at a time. This will allow you to focus your energy and fully make changes without cutting corners. Focus your energy on a single thing you can change, whether it’s removing a food item, addressing a person who is causing you stress, or adjusting your activity level. As you successfully make each change evaluate how that change affects you. It’s wise to continue to keep a journal during this period. This will allow you to really see small improvements, that you might otherwise not really notice. Did the change decrease your stress, pain, or fatigue levels? As you improve one area you can move onto another area and begin making changes there. Continue to track as you go so that you can see the outcome of each change you make. This will help you stay motivated. Your plan will probably never be complete. Don’t let this stress you out. This is just how life works, we are constantly changing and adjusting. As you find what works or doesn’t work you will need to make adjustments. Changes in your life may mean that a change that works at one time may not work later. Continually assess and adjust as needed. You may find that you want to keep a journal long-term to help you identify small changes in your life that might increase symptoms. I’ve found that after my health improved and I started feeling better, sometimes symptom creep would occur. My symptoms would slowly start getting worse without my realizing it, until they were bad enough that I really had to do something. However, had I been keeping a journal I might have noticed changes earlier and made adjustments before I hit a flare. Your friends and family can provide support and help reduce your stress. Don’t be afraid to reach out to your friends and family. Be open and honest with them about what you need. They may be able to help you eliminate a stressor or at least suggest alternate ways to deal with it. Coping with stress can be difficult; however, if you can learn to minimize stress before it become a problem, you can limit its effect on your symptoms. Following these six steps for coping with stress can help you cope with any type of stress, whether it’s physical or mental. Continue journaling to help you assess your stress and fatigue. Set goals and make a plan to help you take action. Once you’ve taken action continually assess and adjust as needed.